One of the good things about 140 characters is that it concentrates the mind and lets you compose your elevator speech. One of the bad things is that while concentrating the mind and composing the elevator speech you forget to write it down. So Eli, aka @EthonRaptor (Ms. Rabett came up with the moniker) has been exchanging with various characters on the Tweeter about renewable energy, nuclear energy and carbon taxes (go read the timeline if you really care) and this has indeed conciliated a few thoughts. ADDED: Energy Star is zeroed out in the Trump budget. 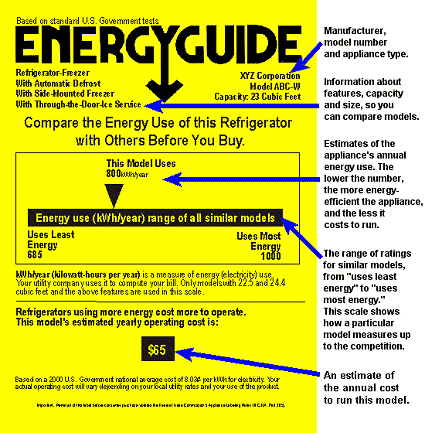 If Energy Star is going on hiatus, then this is a place for the manufacturers to establish an Underwriters Lab for efficiency. All electrical devices in the US are certified by Underwriters Labs not to be fire hazards. The insurance companies established and fund UL because at the turn of the century too many electrical appliances were starting fires or sauteing people, and some sort of testing and certification was needed to limit loses. 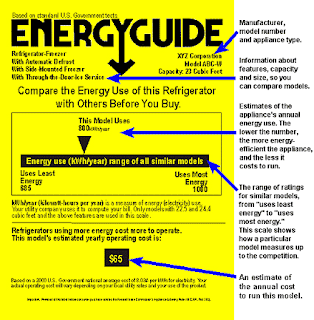 An Energy Star operation could charge manufacturers for testing and use of the brand. What it could do immediately is to re-publish the Energy Star website before Scott Pruitt sends it down the rat hole. Anybunny have a spare server? The info is a US Government publication and there is no copyright. There is money to be made here folks and this would be a great opening for a Kickstarter operation. It would be a natural for Consumer Reports. Eli's original though still holds, things are bought on purchase price. Very few think about lifetime, operating and disposal costs without prodding from regulations and SJWs. Which brings the Bunny to Part Two. What is the probability of a nuclear revival in the US. The reason is very much the same as what happens when a bunny purchases a carrot storage device aka refrigerator (Eli does leave a bit of room for Ms. Rabett's yogurt, after all, she is his muse). Nuclear power plants have a)very high capital costs and b) very high decommisioning costs although operating costs are very low. From the standpoint of a utility, a nuclear plant requires a large investment before it begins to generate revenue, and a pretty well undefined commitment for decommisioning. Since b) has to be carried on the spreadsheet as a liability, and the actual cost is pretty well undefined the CFO of a utility would have to be insane to agree to building a nuclear plant. To be clear, this is not the case where the plant is built by a government or a government entity like China, or EDF or TVA because their time horizon extends well beyond the next quarter. It also explains why natural gas is being substituted for coal. Not only is natural gas cheaper, the capital costs of natural gas power plants are lower, they are more modular and they can be slotted into existing spaces, built faster, etc. and oh yes, much less polluting even if you consider greenhouse gases and nothing else. The nothing else is the ground level pollution of the air and water that makes Chinese and Indian cities so deadly today, and Western cities so deadly yesterday. It costs capital to clean coal emissions up and safely dispose of the ash and that erodes any desire of utilities to continue investing in coal. Let us not talk about the energy and $ cost of carbon capture. Even there natural gas has a big advantage. Carbon capture technology from the smokestack will require serious cleaning of the emissions. Capture from the ambient air, is IEHO, the affliction of science. Of course if the utilities can dump the emissions and the ash wherever, that encourages investment in coal. Coal is the ultimate tragedy of the commons. To deal with it requires moving those costs onto the utilities and mines balance sheets. Utilities need to be exposed to the cost of their emissions to move them away from fossil fuels. Renewables are a different balance. Operating costs are small but capital costs are high although decreasing. The modularity of renewables is a great advantage over nuclear which comes in single ginourmous lumps with long construction times. A single wind turbine, by nature requires only a small investment. As with gas turbines, the wind/solar components can be mass produced in factories and shipped to the assembly site. Wind farms/solar can be installed in smaller chunks each of which comes on line as finished and can start to immediately generate revenue to support further installations. So the action on the power generation front is going to be renewables vs. natural gas. 1. Regulations to limit the worst emissions, quantify costs and show them explicitly to the public. Limitations are necessary for those emissions whose cost is so high that their effects are immediate and dangerous, such as lead and NOx. 2. A tax on greenhouse gas emissions which would either displace other taxes or be rebated. See Eli Rabett's simple plan to save the world the brilliance of which is that it really would not require Trump to sign on, if the rest of the developed world did. Having solved all problems, Eli hops on. Twitter and Facebook are weird. I don't use either, for obvious security reasons, but as a scientist I blurt out my thoughts in stream of consciousness and real time, and in essays and blog posts, because it's the only honorable thing to do. Clearly blog posts and white papers are rapidly outpacing peer reviewed journals for the breakthroughs (and the ArXiV of course), but lately (in the last few days) I've taken to tracking KremlinGate conspiracy theorists and American patriots and other nutjobs on Twitter. Is anybody else watching what is going on there? It seems like the big reveal is upon US. It appears to me from my observations that we now provably have an illegitimate government and the powers to be might be poised to actually do something about that. Interesting times for sure. I was so looking forward to proving Eli and PZ wrong on space colonization. Nuclear war would not be helpful for that little side experiment of mine. Facebook and Twitter are the postmodern equivalents of the Tower of Babel. Their ilk are most definitely NOT the venues to seek knowledge and/or truth. Oh, the EPA'a ENERGY STAR website is still fully functional AFAIK (I checked out the entire tree of links and found exactly one broken link, see below). You saying some such, today as we speak, is equivalent to Trumpkin saying that Obama wiretapped Trumpkin Tower. Don't know what happened last night when Eli looked but it was empty then and stupidly the Rabett did not WebCite it. Apologies. Also have not compared what is there now to what was. German wind and solar are at an unrespectable 2.1% and 1.2%, respectively. That's not what I am seeing when I google 'Europe Renewables'. Face the facts, Canman, you're both a liar and a shill. And get this, you aren't a scientist. That hurts. If you're gonna call me a liar, could you at least provide an example of something that could plausibly be construed as being a lie. The allegedly high & un-accountable cost of nuclear decomissioning is neither high nor un-accountable. In fact, US nuclear plants are required by law to pre-fund their decommissioning in escrow accounts, and to report on those accounts regularly to the NRC. The cost of decommissioning amounts to roughly 10% of construction cost, which is comparable to any other large construction project. Wind power has big advantages in being cheap and fast to build, while not emitting CO2. It has big disadvantages in being high-maintenance, short-lifespan, and intermittent (i.e., unreliable). The last point isn't too important when wind is embedded within a diverse generation grid, but as we move toward a zero-emission system it will become critical: the more variability we push onto the grid, the greater the demand will be for dispatchable power to make up for intermittancy. I hope readers of this blog will recognize that fossil gas is not an acceptable solution to that problem. Eli is right that current nuclear plants are too big and too expensive (though not so much as most people believe, when plant lifespan is considered), but he is wrong that the chances of nuclear revival in the US are zero. In fact, NuScale's design is currently in review by the NRC (expected to take a ridiculously long 40 months), but after that point they will be manufacturing small modular reactors in-factory for shipment to site. This is exactly the model that can be expected to drive costs way down. You claim that renewables aren't working and can't work. Because they have not replaced fossils fuels yet. You're an obvious paid shill and liar. Put your money where your mouth is KAP. Invest in Toshiba and/or nuclear. FWIW, when I google "Europe Renewables" the second link on the list points to Eurostat energy statistics, which eventually led me to their energy database. For 2015, latest year available, wind was 2.17% of Germany's primary energy use, solar thermal 0.21%, solar PV 1.06%. I would kindly suggest an apology is in order. I guess you missed all those articles where they no longer require subsidies for new installs, among the dozens of other positive articles I am reading in the last day or so. Maybe try 'Google News'. I will never apologize to dishonest liars and paid shills like you. Anonymity is your friend. Everyone here knows who I am. Remember now, Toshiba needs your investment. Where on the back of my Mac OSX can I find the energy cost of a tweet? Has witter revealed a general statistic in Megattweets per kiloWatt-hour? The German utilities did not put away enough money for decommissioning and were "unfortunately" allowed to invest that money in their own company. Thus now they threatened to simply go bankrupt and leave the moral hazards in the landscape. As a result of that blackmail the German state now have the risk that decommissioning will be much more expensive than expected in return the utilities paid a bit to state. Do not make this "mistake" elsewhere. Real-existing nuclear has the same problem as wind and solar energy, it does not follow demand. For some this is only a problem for wind and sun. Sure Victor, decommissioning wind and solar installations is going to be a real hassle in the next couple thousand years. 8c7793aa-15b2-11e5-898a-67ca934bd1df, that was a new second point. Real-existing nuclear has the same problem as wind and solar energy: it does not follow demand. Solar and wind have horrible decommissioning consequences. Those metal towers and frameworks take hundreds of years to rust away. And there's no aftermarket for used panels and solar irradiated single crystal silicon. And then what's going to happen when we switch to plasmons and excitons and exotics? And atomic color centers and such? Existing nuclear power plants in France load follow. All you need to decommission a wind turbine or solar PV is a crane and a truck. Cmon. Use the Get Info tab on the menu. Eli,it worked, but the inquiry cost me 200 mg of CO2 to find out that a tweet emits 20 mg. When you close a nuclear plant well before its lifespan, as they did in Germany, of course there hasn't been enough time to fully fund decommissioning. That's the German government's own fault, from their own misguided decision, and they deserve to pick up that bill. Nuclear can load follow as well as any CCGT gas plant; both ramp at about 5% per minute (because turbines don't care where the heat comes from). Nuclear load-follows in France routinely, and nuclear load-follows routinely on US Navy ships. In the US grid, nuclear doesn't load follow because it's cheaper to turn off the fossil plants first. But that's an economic decision, not a technological constraint. France dumps electricity at night and therewith subsidizes power for other countries. They are now also switching to cheaper solar and wind power. Talk about intermittent power, during the 2003 heatwave France almost had to shut off a large part of their nuclear power plants and the cooling need continues long after. Nuclear energy is one giant moral hazard. No one knows what the decommissioning will cost and no nuclear power plant has an insurance for large catastrophes. Privatize the gains and socialize the loses. Same moral hazard as the one producing the 2008 deregulation crash. On cynical days I think that is why Republican activists like nuclear so much. Decommissioning cost are about 600 million per nuclear power plant (latest update decommissioning cost estimates OECD-NEA). For a 1GW nuclear plant running for 40 years, running at 85% CF, this cost comes down to about 0.2 ct/kWh. I'm sure those nuclear plant decommissioning costs covers the cost of nuclear meltdown cleanup (three so far) and nuclear waste storage, no? How many water cooled nuclear reactors are sited on earthquake faults? Paid shills have no shame. Engineering ecomodernist. Interests include: energy, efficiency, environment, climate, politics, innovation. I should probably take the time to look these cranks up before I crush them. How much Toshiba stock do you own, Joris? Victor Venema: "Real-existing nuclear has the same problem as wind and solar energy: it does not follow demand." BlueHost is the best website hosting provider for any hosting plans you might require.